I’m glad I was there at the reading. It was actually an even better experience then I imagined it would be. Patrice seemed to me like an incredibly fascinating person after explaining us her origin and her family, the way she spoke about her books, her humour, in general I found her amazing. As well were amazing her books, Orangeboy and Indigo Donut. They seemed to me like pretty original ideas, and I liked the way she mentioned she used bits and pieces of her reality to make them part of her character’s reality. What I also really liked about her books is that there will be people who could identify themselves with the characters, and maybe even the stories. In general, the reading was just amazing, and I could recommend the books. And I’m glad I got to meet Patrice. What a creative group of children our primary student in classes P2EN are! When Jane Clarke explained the process of making a book she did it in a very special way: By showing her “book of ideas” with the first sketches of her ideas, “black and white rough” of the illustrator and in the end the final result – her book “Knight Time“. She also explained the different parties involved in this process – e.g. editor, illustrator, publisher, buyer – pointed out the time this process requires and made the children realize that not every great idea and story would instantly turn into a book, be published and end up for sale in a book store. After introducing the children to her ghost writing “Dinosaur Cove” books – which will most probably be on the most wanted book list of some more students by now – time had come for the children to start the process of creating their own dinosaur. Jane Clarke pointed out the unlimited possibitlies of creating a “sillysaurus”, “princesssaurus”, … and set free the enormous creative potential of our young students. After sharing their unique dinosaurs with Jane and their classmates our guest author encourage the children to make their dinosaur come to life by thinking about where it lives, what it eats, how it moves, which noises it makes and so on. 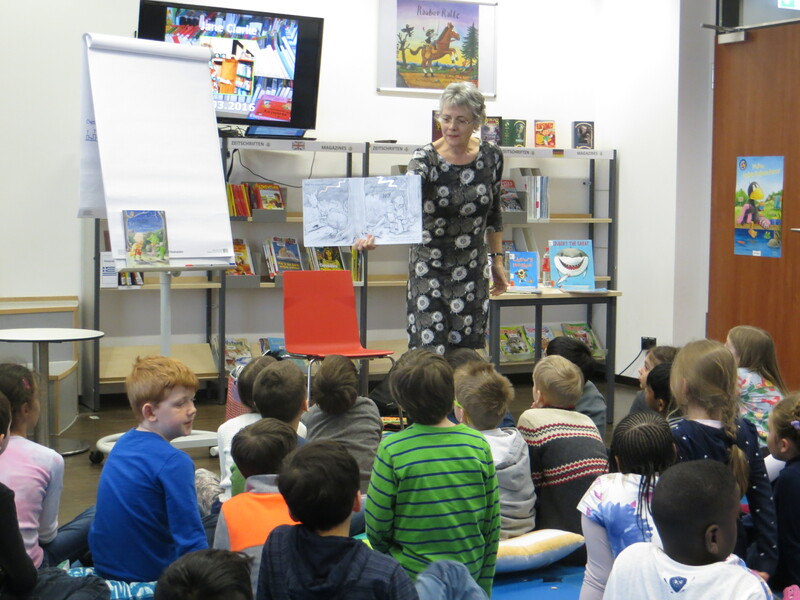 The children were as eager to share their dinosaur stories as they had previously been with their dinosaur pictures and just as before, Jane Clarke gently supported the children in developing their ideas further and emphasized on the countless ways a story could develop. It was a truly inspiring experience for our students!